November 29, 2010  Presidential elections in Haiti Sunday disintegrated into street protests after 12 of the 18 candidates said the balloting was fraudulent. Before the polls had closed, the candidates said they would not accept the results. 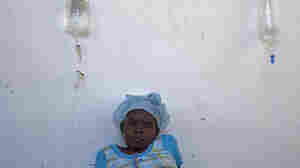 November 27, 2010  The cholera death toll continues to rise in Haiti. According to official figures from the government, at least 1,648 people have died and there have been more than 72,000 confirmed cholera cases. 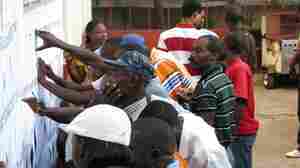 November 25, 2010  Long lines formed outside government offices in Haiti on Thursday as people made last-minute efforts to collect voter ID cards, which they had applied for months ago and which they need to vote in Sunday's presidential elections. 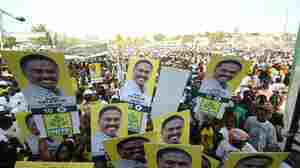 Meanwhile several of the leading candidates held rallies in the capital. November 25, 2010  Battered, beleaguered Haiti holds presidential elections Sunday, nearly a year after its capital was devastated by an earthquake and amid a fast-spreading cholera epidemic. 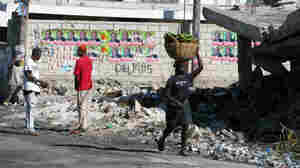 But many Haitians have little interest in this key election and little hope that any of the candidates can improve their lives. November 23, 2010  The number of Haitians killed by cholera has climbed to more than 1,300, with tens of thousands of others sick with the illness. The deadly epidemic is spreading as Haiti is preparing to hold elections, nearly a year after an earthquake devastated the capital. November 23, 2010  The Haitian government has released new figures showing the cholera outbreak has reached eight of the country's 10 provinces; more than 1,300 people have died. The cholera epidemic hit as the country is still recovering from January's devastating earthquake. On top of that, presidential elections are scheduled for this weekend. November 22, 2010  In his two years as chief, Julian Leyzaola has purged his force of corrupt cops and returned a sense of safety to the city. But human rights groups say he has gone too far in his battle against some of the most powerful criminal syndicates in the world. November 14, 2010  Many Mexican politicians view the current drug war -- which has claimed roughly 30,000 lives over the past four years -- as one more curse foisted on Mexico by their rich neighbor to the north. November 10, 2010  As more cholera cases are confirmed in the Haitian capital of Port-au-Prince, frustration is growing with the slow pace of the recovery from January's earthquake. More than a million people remain in makeshift camps, and most of the rubble still hasn't been cleared. November 9, 2010  The threat of Hurricane Tomas has passed, but Haiti is facing a cholera outbreak. Amid fears that the deadly waterborne disease could spread quickly in the crowded camps for earthquake survivors, aid agencies and the government are working to contain it. November 8, 2010  Hurricane Tomas skirted Haiti's capital last week, but the storm drenched the earthquake-ravaged country, highlighting its still-fragile state. Almost 10 months after the quake, more than a million people are living in makeshift camps. Even at one of the "better" camps, life is incredibly difficult. November 7, 2010  As Hurricane Tomas neared Port-au-Prince's fragile refugee camps, NPR correspondent Jason Beaubien was sent to cover a story he hoped wouldn't happen. 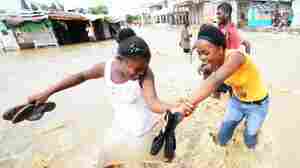 November 5, 2010  Hurricane Tomas battered Haiti's western tip and drenched the hundreds of thousands of earthquake survivors encamped in flimsy dwellings in the nation's capital. But Tomas' heaviest winds remained largely offshore and the storm did not do the kind of damage that many had feared. 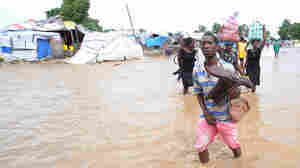 November 5, 2010  More than a million displaced Haitians are bracing for the effects of Hurricane Tomas, which is expected to pass by Haiti early Friday. 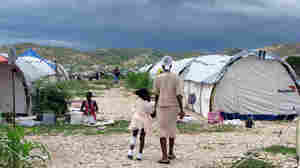 November 4, 2010  Haitians still living in tent cities or squatter camps nearly 10 months after an earthquake devastated the capital now are gearing up to face down a possible hurricane. Tropical Storm Tomas is bearing down on the Caribbean nation.